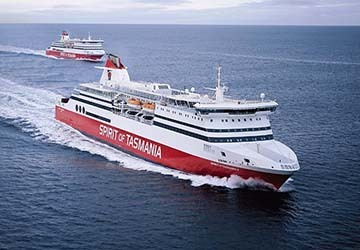 Run by TT-Line Company Pty Ltd, Spirit of Tasmania connects the Australian mainland with the island of Tasmania across the Bass Strait, travelling between ports in Melbourne and Devonport. Spirit of Tasmania’s twin ferries travel nightly, all year round, with additional daytime sailings operating on selected dates during peak season from December to April. On board the twin ships, Spirit of Tasmania I and II, you’ll find numerous facilities to keep you entertained during the crossing. There are 222 well-equipped cabins on each ship that make for a comfortable and relaxing overnight sailing, while recliners are also available which represent a great low-cost alternative, located in a private lounge with floor-to-ceiling windows. In terms of capacity, the ferries themselves can carry up to 1400 passengers and around 500 standard cars. Spirit of Tasmania's ferry terminals can be found at Station Pier in Port Melbourne, Victoria on the mainland and at The Esplanade in East Devonport, Tasmania. 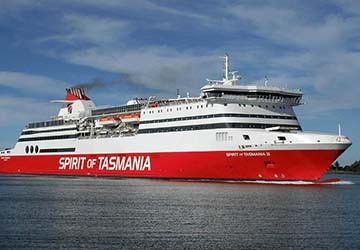 Directferries.com allows you to compare Spirit Of Tasmania timetables and fares with all alternative ferry operators before deciding on the best option for your trip.